The Minnesota Wild have scratched forward Thomas Vanek two games in a row, despite finding themselves in an intense playoff race. The club currently sits with a 34-28-11 record, good for sixth in the Central Division. But head coach John Torchetti isn’t letting their precarious position change the plan, at least when it comes to Vanek. He put his $6.5 million man on notice last week and the 32-year-old winger from Vienna will have to pick up the slack if he wants to put himself back in the team’s good graces. Even with an injury to Ryan Carter on Saturday night, the Wild still scratched Vanek on Sunday night and put Chris Porter in the lineup instead. If that doesn’t send a message, nothing will. 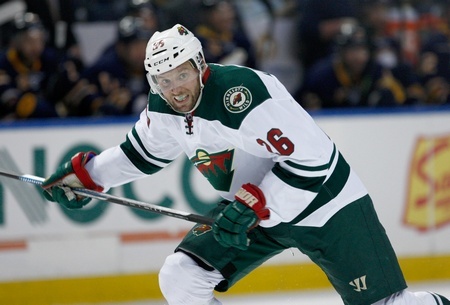 Vanek is currently third on the Wild in scoring with 41 points in 70 games, including 18 goals. He has six goals on the power play. But Torchetti’s struggled to find consistency out of his player, with Vanek’s work ethic coming into question. That’s a pretty loaded statement, but it also lays all the cards on the table. Plainly put, Torchetti doesn’t believe Thomas Vanek can help his team win games. If that’s not a blistering indictment, nothing is. And it pays to remember that Mike Yeo felt similarly, right before his exit from Minnesota. Over the past 10 games, Vanek has just three assists and 14 shots on goal. He may have earned his spot early, but his play has all but petered out as of late and he’s been a non-factor on most nights. The team does have options, with a buyout among them. They can take care of the final year on Vanek’s contract and free up about $5 million in the process, but such an option will put them on the hook for a little bit of retained salary for a while. They’re already in it for a million thanks to the Matt Cooke buyout, so adding Vanek’s name to those numbers may not be the best consideration. Another option is to hope this passes. They could put their player back in the lineup after two benchings and hope for the best. Vanek could turn things around and he could provide some level of elevated offensive play (in other words, he could shoot the doggone puck), which would in turn give him some trade value. Minnesota could look to offload him in 2016-2017 for a pick, if they’re lucky. Right now, the writing is on the wall. Vanek has to shape up for the Wild and Torchetti has been sending a message. With the team on the playoff bubble, now’s as good a time as any.